Oct. 20, 1960. Providence, R.I. The U.S. 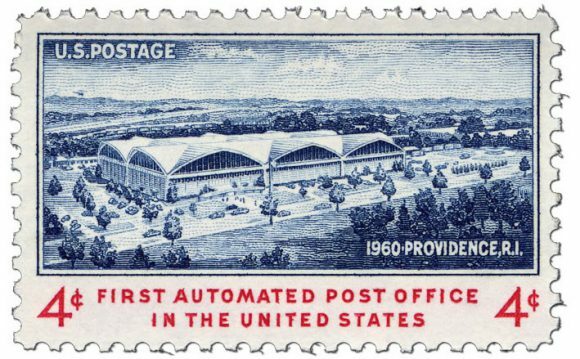 Postal Service turned on the country’s first totally mechanized mail processing plant. Machines started doing the work from A to Z. Did it all. No hands! It was a big deal. Historic. Dramatic. Badly needed. Long-planned. Hugely publicized. And controversial, it turned out. And I was there, on assignment for my paper, the Worcester Telegram-Gazette. Ben Franklin back in Philadelphia in 1763 was the first postmaster, but just for the Pennsylvania colony. Two years later he was appointed postmaster general by the Colonial Congress for all the colonies. And went on to do it with the zeal and smarts that became his hallmark in everything he undertook. That was a big deal, too. People could write to one another and keep in touch as never before. And what a giant boost that gave businesses and the national economy. All made possible by the establishment the U.S. Postal Service at the birth of our country. Manned by men trained to do the work from as a career job —selling stamps, processing the mail, and delivering it on a reliable schedule. Within a neighborhood, within a geographic area, within a whole state, then to other states and regions, the list expanding every time a new star got added to our flag. What a sensation it was when the dashing young riders of the Pony Express made it possible to speed a letter to California in just 8 or 10 days. True although only a wealthy person or big business could afford it. Steadily the price of postage dropped. The railroads were laying more track. Ships began shifting from sail to steam, crossing the Atlantic in 10 days rather than 40. Steamships with good luck could get the mail from New York to San Francisco around the Horn in a few weeks rather than the three months the great tall ships with their enormous sails took. On and on. Progress over the decades became dramatic. For instance. When I was a boy in Pawtucket, R.I., our mailman Mr. Sherlock was bringing us our mail twice a day. Imagine that. Morning and afternoon, and Monday through Saturday, would you believe? He started every Monday for the week with his blue uniform freshly pressed and his shoes shined. And he did the job day in and day out regardless of the season or the weather. He would start his day by reporting at our big post office on Main Street. Other workers had already deposited the fresh mail for Pleasant View into the Pleasant View box. Pleasant View was our neighborhood and it was his assignment. He would organize its mail by street and number and pack it with practiced efficiency in his big leather bag. He would heft it, walk a block and climb on the trolley to our neighborhood and begin his first circuit. Truth is, Pleasant View had become less pleasant now built up as it was with three-deckers shoulder to shoulder on every street. A modest neighborhood but respectable and a fine choice for working class people. We lived at 18 Coyle Avenue, which was one block long. We had English, Irish, French, Syrian, Polish families, well, that we knew. If you don’t remember, three-deckers had three tenements for three families. Those houses were a a brilliant invention. There are still plenty around. Still provide good housing. Mr. Sherlock would start slipping the envelopes through the three slots every three-decker had. Everything in his bag was a social or business letter. If a package had come in for someone, he’d slip through a notice to go pick it up at the post office. Well, this is what I recall of all that. Junk mail was still far in the future. At half past 11 or so Mr. Sherlock, his bag empty, would take the trolley back downtown. Eat lunch, restock his bag and come back to do his second circuit. Only a heavy rain or snow storm would daunt him. He hated that and so did we. He because the next day his bag would be extra heavy. And we because we missed getting mail maybe. Mr. Sherlock was proud to wear his uniform. It was more than a job. It was a career. The Postal Service had become a proud service. Somebody had even said that in inspired words that caught the importance and significance of it. I’m sure Papa and Maman had never heard those words. They wouldn’t have understood them anyway. They were immigrants, like so many neighbors. I hadn’t. I was too young. Maybe Mr. Sherlock hadn’t either. But it’s men like him who inspired it. When I happened upon those highfalutin words much later, I totally got it. It made me feel good about the service. I hope that Mr. Sherlock got to hear them before he put his uniform aside for keeps. It’s important I tell you one thing. How exciting it was for Papa and Maman to get a letter from a friend in nearby Woonsocket, say, and even more so from a brother or cousin perhaps back in Quebec. Wow! Papa and Maman had come down to Rhode Island from up there. Maybe it was an invitation to a wedding. Exciting. But maybe the news of the death of a father or sister, God forbid. I don’t recall telephone service being around then. But if it was, we didn’t have it. I do remember there was anticipation but also apprehension about what Mr. Sherlock might leave off. Papa and Maman called that service a blessing. It was a wonder. Hi-tech, mind you, to use an expression that hadn’t entered the language yet. They hadn’t known such when they were my age. Hadn’t even thought it possible. Fact is, it was the count-on-it reliability and broad saturation of that service that steadily pushed back our frontiers and began to meld us as Americans. But the day had come when the Post Office needed better. Much better. After heavy campaigning it got the okay to build a totally mechanized regional processing center. I have no idea how Providence got chosen. Much heavy politicking, I’ll bet. What a daunting undertaking. Remember the mandate, no hands! So what machines would be needed to take in the mail, flip every piece right side up, read every address … so many scrawled or barely legible? How to make sure each piece was properly stamped … there were different categories with varying postal prices … how to send the letters and packages on their way to the right place, maybe next close by in Pawtucket, but maybe to Pensacola, Florida, maybe even to Paris, France? How to organize that flow? Make it smooth and fool-proof efficient? Move the mail along from machine to machine? How much floor space? One floor? Two floors? What kind and size of building would it take? On what side should trucks with the fresh mail arrive? The trucks taking the on-on-going processed mail on its way? How many trucks would be needed? How much parking space should be available? And what should be the attributes of an ideal location? And so important, how many workers would be required, and how should they be trained for these newfangled machines? Shouldn’t they be workers displaced from the city’s big downtown post office, which would be closed, it was assumed. The goal was not only to assure better service. It was also to save money in getting the work done. All premised on the necessity to build a plant that would comfortably process a million or more pieces of mail a day! And of course the new center should become a lab for other such plants across the country. What the designers faced was a challenge in a thousand ways. Well, it all got done and the big day, October 20, arrived blue and sunny. All-out publicity had alerted the nation to what was being hailed as a “turnkey operation.” A PR genius had come up with that. At the dedication a key would be turned, so to speak, and the plant would rumble into operation. I just checked and I found “turnkey’ in my Merriam-Webster dictionary now. The new building itself was a wonder. Ultra-modern. Futuristic, which was also a new word. Nothing else came close to it anywhere, it was said. It was symbolic of the mammoth magical work would take place inside. Everybody took pictures of it. In fact, the Postal Service for the occasion sold a commemorative stamp showing the incredible building. A 4-cent stamp it was, which was the first-class price back then. It sold thousands and thousands. What a fantastic PR ploy nationwide that turned out to be. Everything in the building was on one floor. There were only two posts inside, it was said. Miles of conveyor belts snaked back and forth. I mentioned there was controversy, too. Machines replace workers. Many industries were seeing the beauty of that. Workers were seeing the brutality of that. So did their labor unions. There were mutterings and angry protests. Well, I told you I was there. Not on the actual day. At the big Dedication / PR kickoff just before it. In a throng of journalists. Post Office and Washington and Rhode Island bigwigs. The architects and contractors and designers and builders of the system and machines. Gawkers. A big crowd as expected. Rousing speeches. Great applause. I went back to the T&G and wrote my story and it got a big headline and big display. Rightfully so. This was big news. National news. Good news. Promising news. By the way, I got the assignment because I knew Providence. As I said, I was a Rhode Islander. And for two years after college in Worcester I had been a graduate student at Brown University right there in Providence. In fact, back then it was routine for me to walk by that big old downtown post office whose future was now problematic. Plus though full-time at the T&G I had started free-lancing a few pieces for the Journal-Bulletin. Now about that stunt by the J-B. That’s what it deserves to be called, a stunt. A few days before the plant’s opening, the J-B stuck stamps on a pile of letters. It had addressed them to itself at its Fountain Street address. Not real postage stamps. Fake stamps, every one of them. They looked like regular stamps but they were S & H Green Stamps, if you remember those. Tax stamps from Lucky Strike and Camel cigarette packs. On liquor bottles. A variety of such stamps. I don’t remember exactly. And dropped them in the mail. And all those letters got processed by the new plant. Were all delivered back to the Journal-Bulletin. Which made a montage of them and printed it under a big headline saying something like, “New Post Office Off to a Great Start.” Ha! Ha! Yes, the new plant had done the massive job lickety-split, as hoped for and expected. But its machines couldn’t tell the difference between good stamps and phony. And gradually other troubles developed. One result was that the PR label “Turnkey Plant” got tweaked a bit. Somebody said, “What a tur­key that plant is!” And that got passed around and got a lot of laughs. “The Tur_key Plant!” But those early mishaps were no surprise to any reasonable person. All this was pioneer work. All the problems got worked out. The plant’s impact became revolutionary. Other processing plants got built. Automatic processing of the mail became efficient, calm, routine. I think it sparked many businesses to mechanize and automate their delivery of stuff the same way. Especially huge ones. UPS. FedEx. Amazon. Walmart. And others. I mentioned the plant was futuristic. For that matter, inspired by the pizzazz of that building perhaps, Providence has redesigned and rebuilt its downtown so amazingly that it stands out as one of the most beautiful and enjoyable in the Northeast. The plant is still there doing the job, day in and day out, without glamor or commotion. And it still looks futuristic. If only Mr. Sherlock could have lived to see all that. Or Benjamin Franklin.